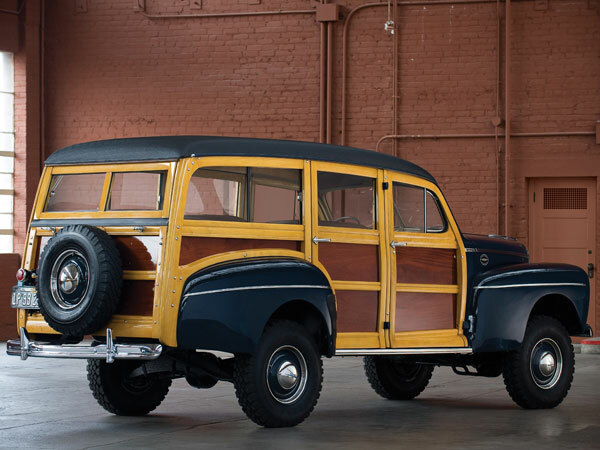 To paraphrase his motto, Nick Alexander Can't Say No, at least when it comes to woodies. 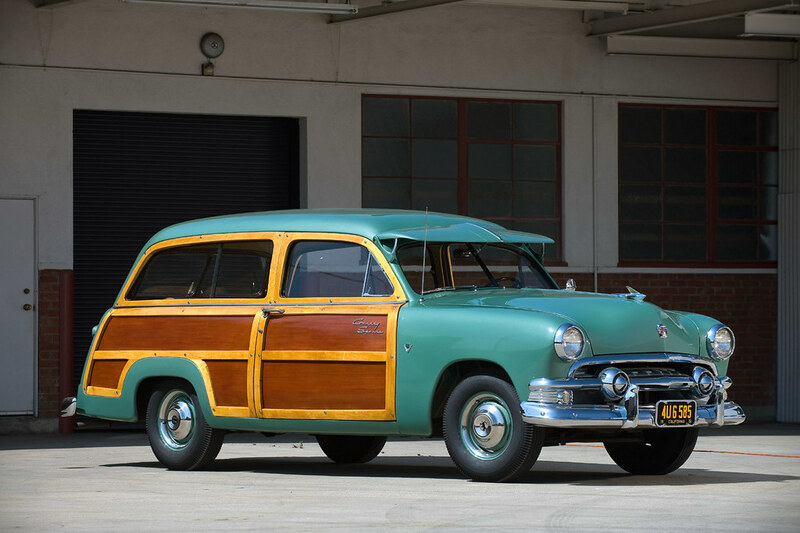 Known in Los Angeles for the last 30 or so years for his BMW and MINI dealerships, he is an avid car collector of all types, but has a penchant for wooden bodied Ford and Mercury station wagons. 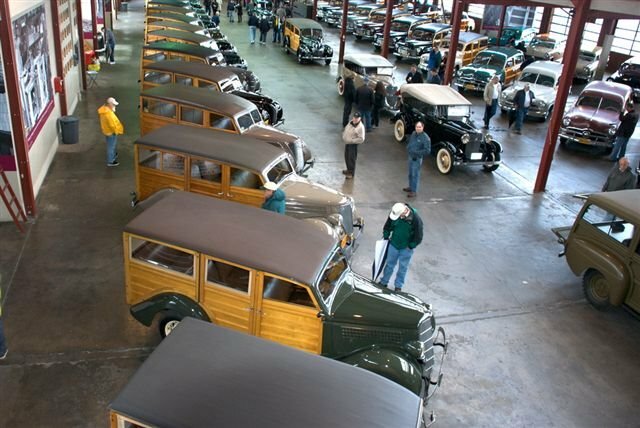 After 10 years, this impressive collection consists of 51 Ford and Mercury woodies, at least one of almost every FoMoCo woody made from 1932 to 1957, all of which are either restored to factory specification or are painstakingly preserved in original condition. 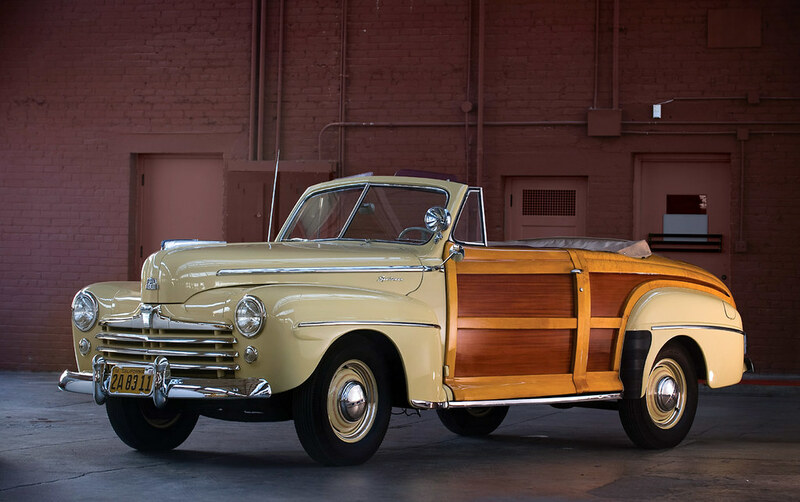 Nick didn't stop there, he also restored an old warehouse in an industrial area south of downtown LA to house the collection, no doubt a perfect backdrop to showcase his wonderful woody collection. Once a year, he would host an open house at the collection and give all proceeds to charity. But recently Costco decided they wanted to put one of their very large warehouse stores right smack dab in the middle of Nick's warehouse; the city agreed and imminent domain (what we'd call a compulsory purchase order) was put into play. This, coupled with the fact that Nick is both a recent retiree and grandfather and he decided not to fight as he would like to spend more time with his grandchildren. So, he decided to put his entire collection up for auction. 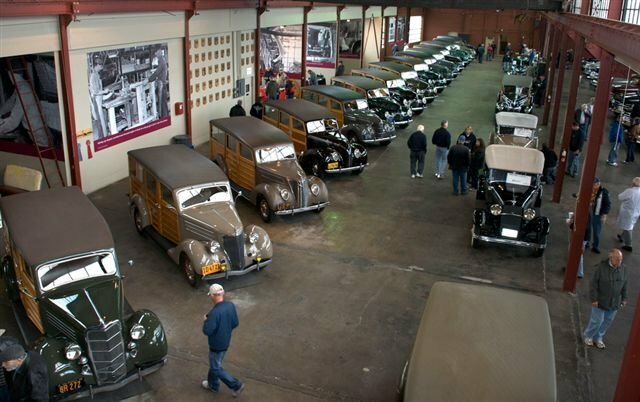 The auction was held in August 2009 at the annual Sports and Classics of Monterey auction. 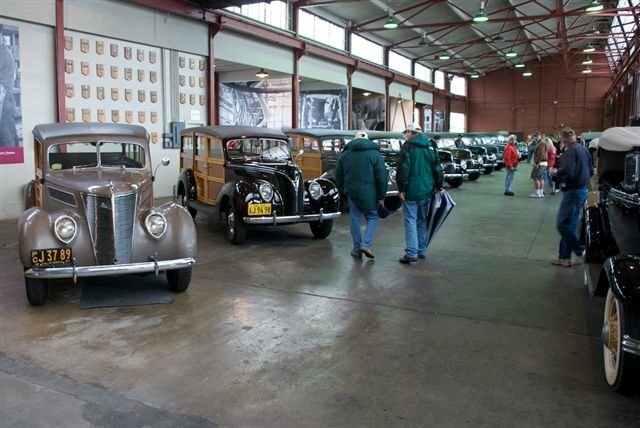 Each car was sold to individual parties and in the end the entire collection netted over $7 million dollars, with Nick choosing to give a large percentage of the proceeds to charity. 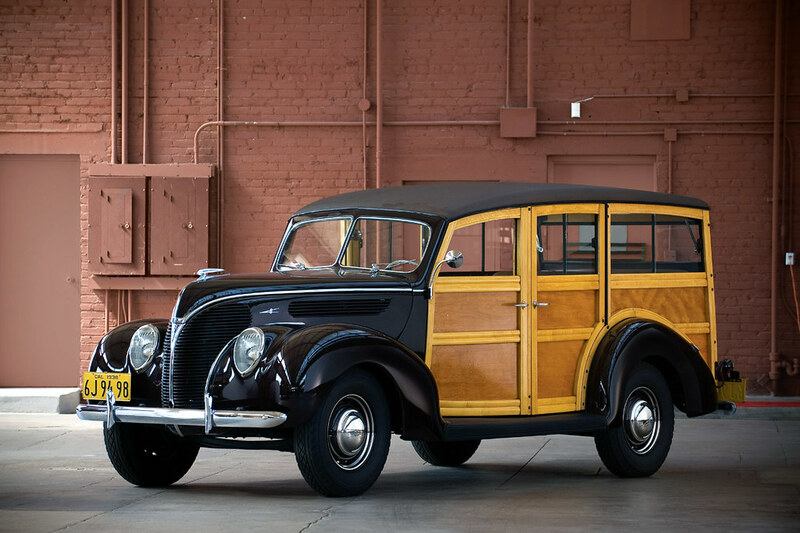 MONTEREY, California (August 13, 2009) – RM Auctions kicked off Monterey's famed classic car week at the Portola Hotel & Spa tonight with the distinguished Nick Alexander Woodie Collection achieving in excess of $7 million in total sales. 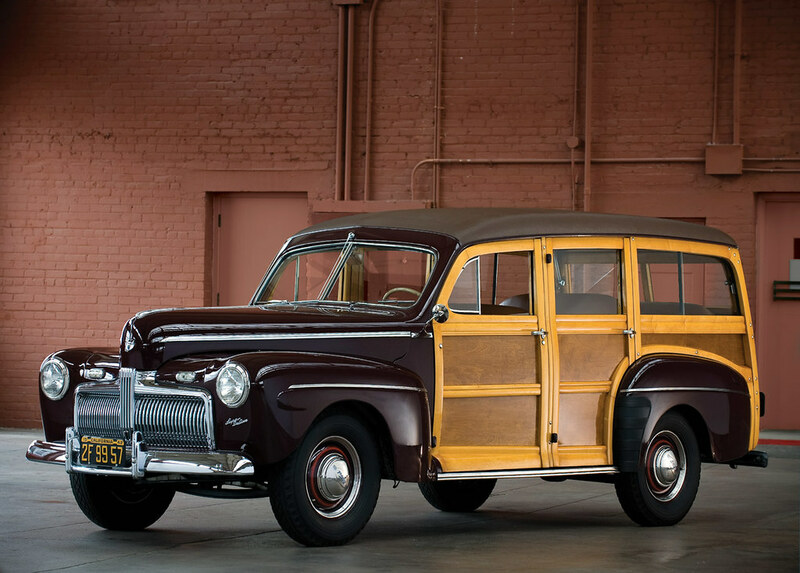 "The early interest and enthusiasm for this collection translated into a very successful auction," said Ian Kelleher, President and Chief Operating Officer of RM Auctions. "The room was filled to capacity, with the sale of each lot celebrated by an enthusiastic crowd. 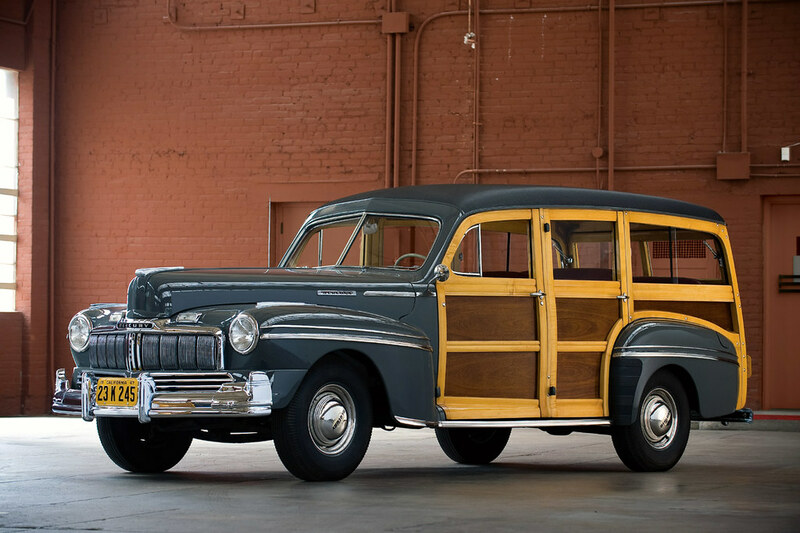 The strong results of tonight's sale, reinforcing RM's strength in the presentation of single-owner collections, sets the tone for an exciting weekend ahead," he added. 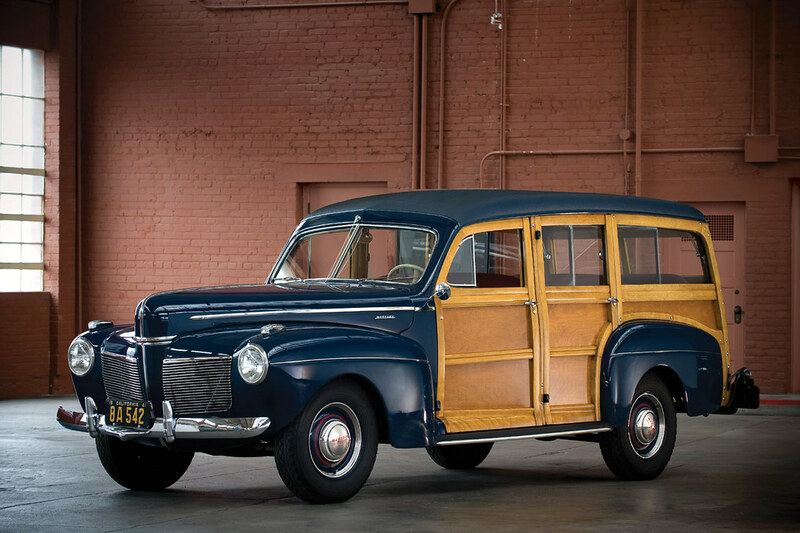 One final car from the collection – a 1939 Ford Deluxe Station Wagon - will be sold as part of Saturday's auction line-up, with proceeds from its sale being donated by Nick Alexander to benefit the Midland School in Santa Barbara, California. This will be added to proceeds donated by RM from tonight's sale of a selection of large canvas reproductions of original photography depicting the histories of Ford, Mercury and the Iron Mountain Factories. RM's Monterey auction action will continue tomorrow and Saturday beginning at 6pm Pacific Time as a magnificent collection of other important and desirable collector cars cross the block, including a historic 1952 Jaguar C-Type – expected to fetch in excess of $3,000,000. 1932 Ford Model 18 V8. 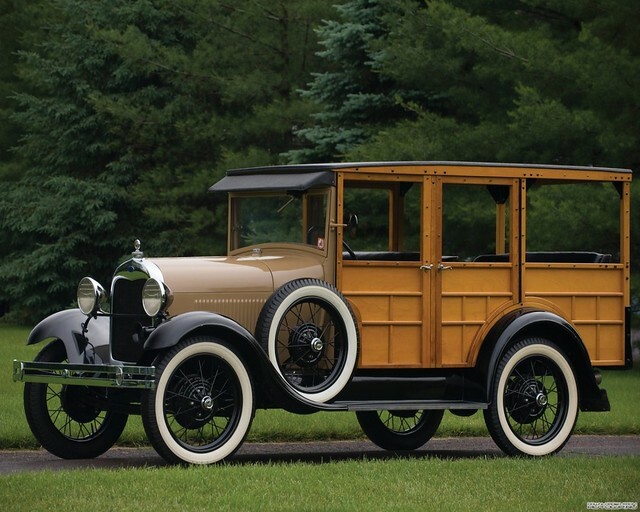 This is the earliest car in the collection, but not the first Ford woody; the Model T and Model A were also built with different types of wood body, some from third-party manufacturers or even owner-built examples, a task made easier because of the separate chassis. 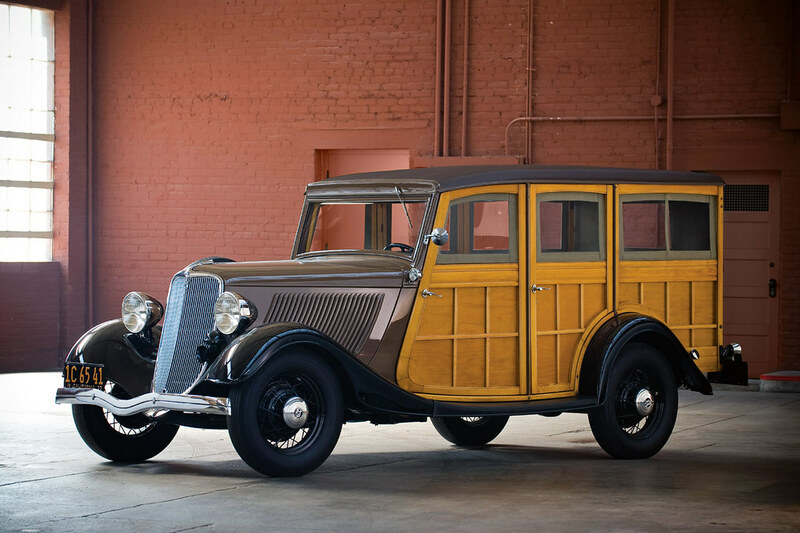 ...and '38 version. Note different grill. 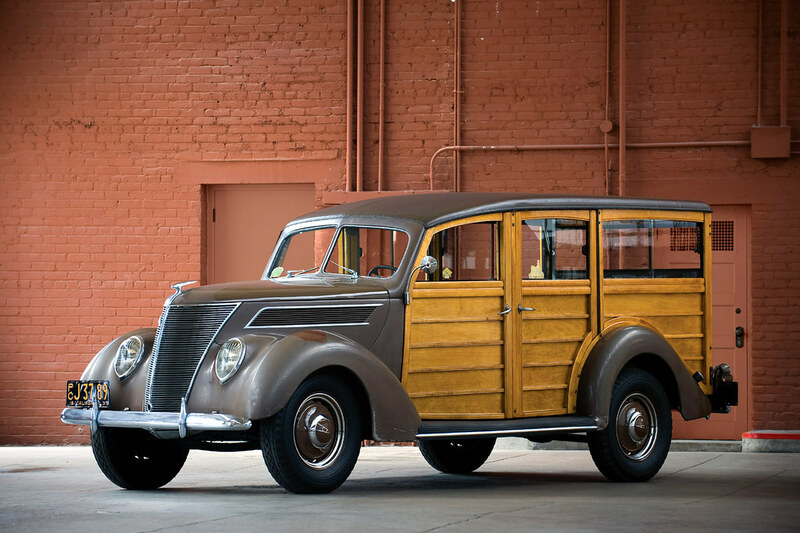 For the 1939 model year (such as this De Luxe), the grill and bonnet were changed. Another '39. He liked this year it seems; he had three in the collection. 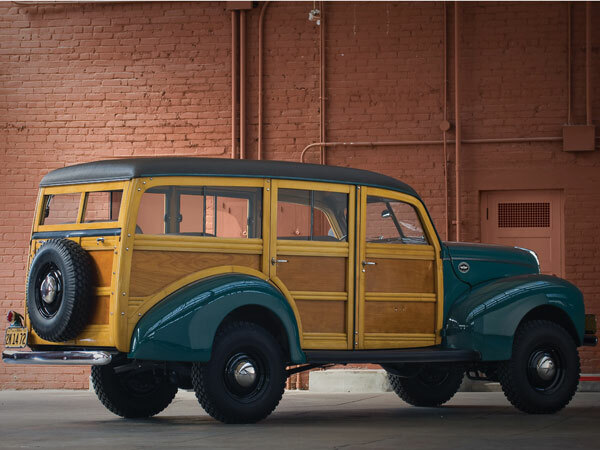 One of my favourites of the collection; a 1940 Standard-Line with Marmon-Herrington 4x4 conversion. 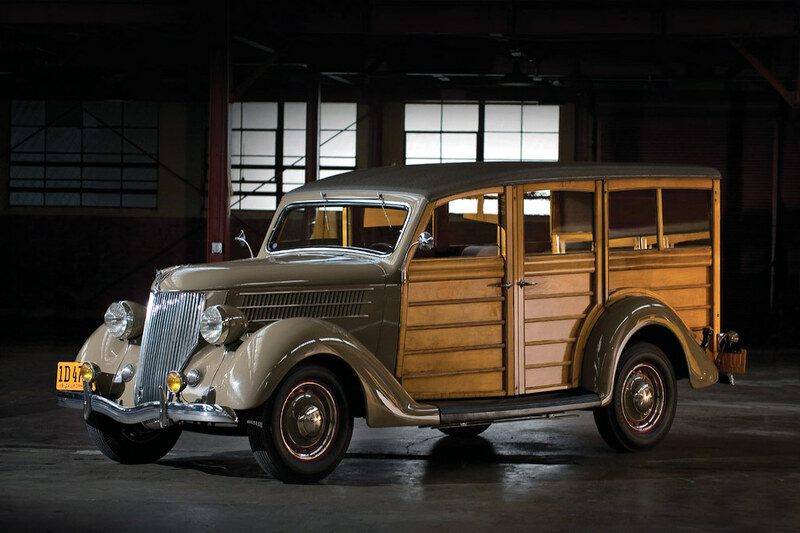 Ford never equipped its own wagons with such a drivetrain, but if a customer were so inclined, he or she could spend the extra money and have the car shipped to Marmon-Herrington in Indianapolis, Indiana. 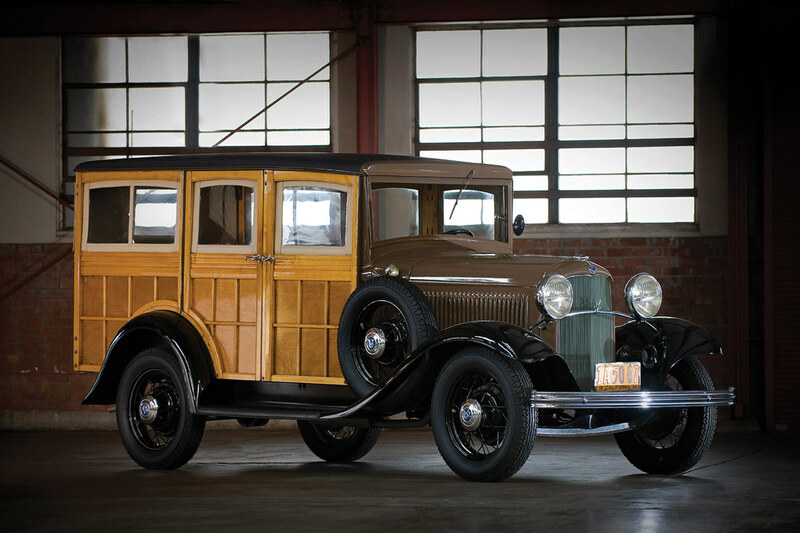 Although it started at the turn of the century as a full-fledged car maker, M-H turned to building front drive axles following the Great Depression (an act it continues to this day). 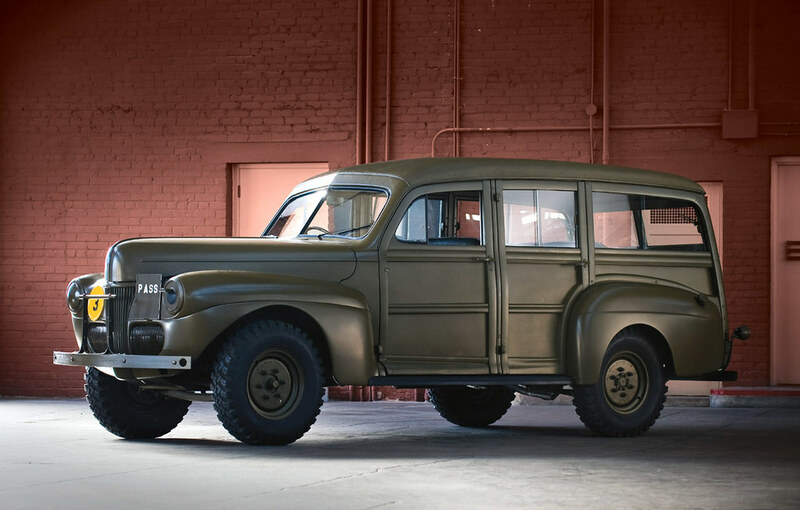 M-H made its name in the 1950s converting Ford F-series pickups to four-wheel-drive, but it occasionally dabbled with off-road wagons. 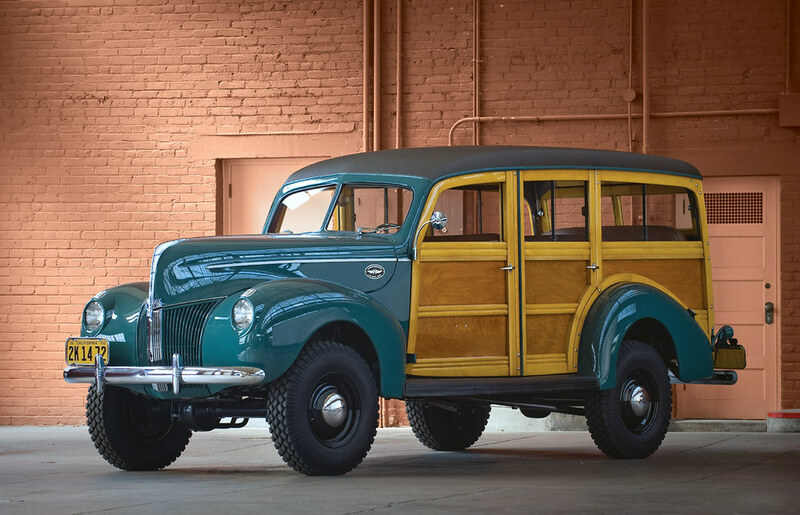 This '40 and the '46 you'll see later on were quite the amalgamation of car and truck; the bodywork and chassis was left largely standard, but Marmon-Herrington installed a four-speed truck gearbox, transfer case, and heavy-duty semi-elliptical front springs. The wheelbase was extended by nearly an inch, and 15-inch wheels and off-road tyres were installed. 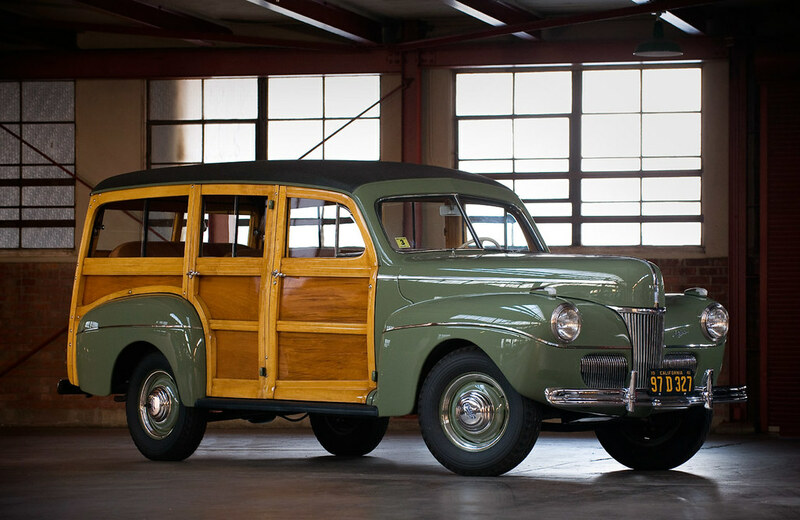 Two '41 models; first a De Luxe..
...and an ex-USAF staff car, also a '41; despite what you might expect, it's only 2WD. 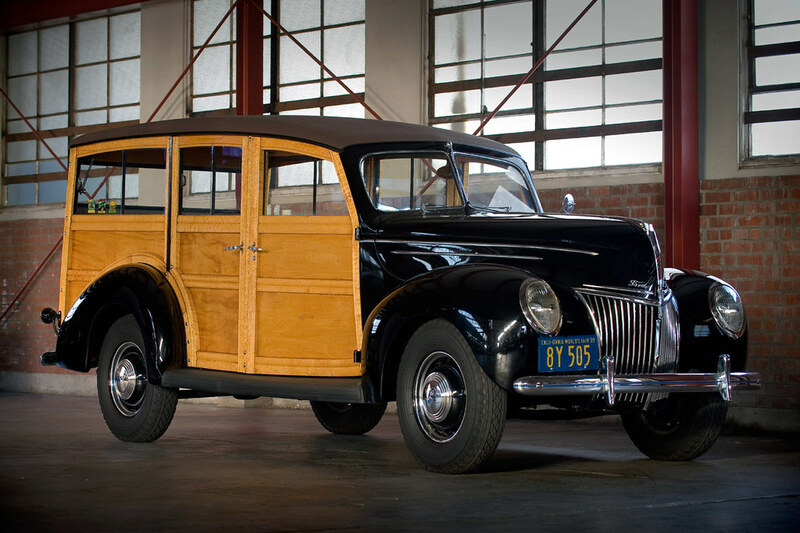 1941 Mercury 8, still a fledgling marque at this point, having only been started in '38. 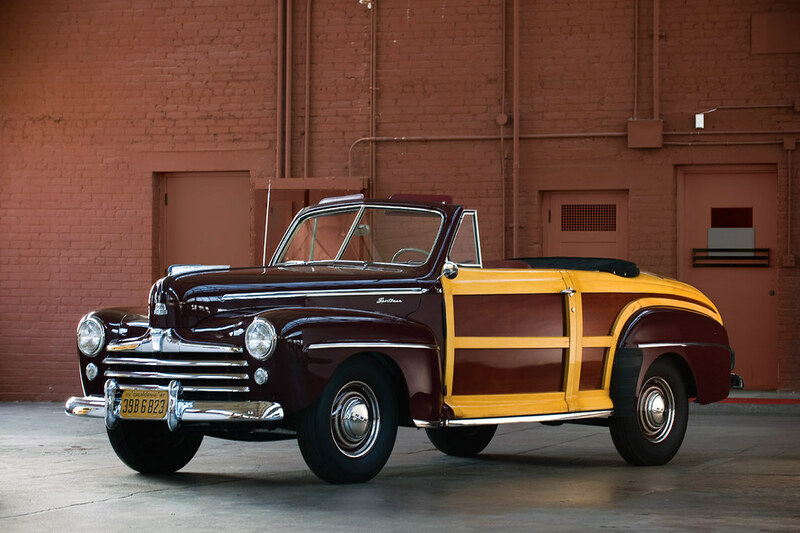 Rarely seen 1942 Ford Super De Luxe & Mercury 8; Ford halted its car and truck lines on February 10, 1942 to begin war production, but not before a short run of 160,432 car were built, making this the company's lowest production year since 1910, and just 2% of total Ford production from 1932-1948. 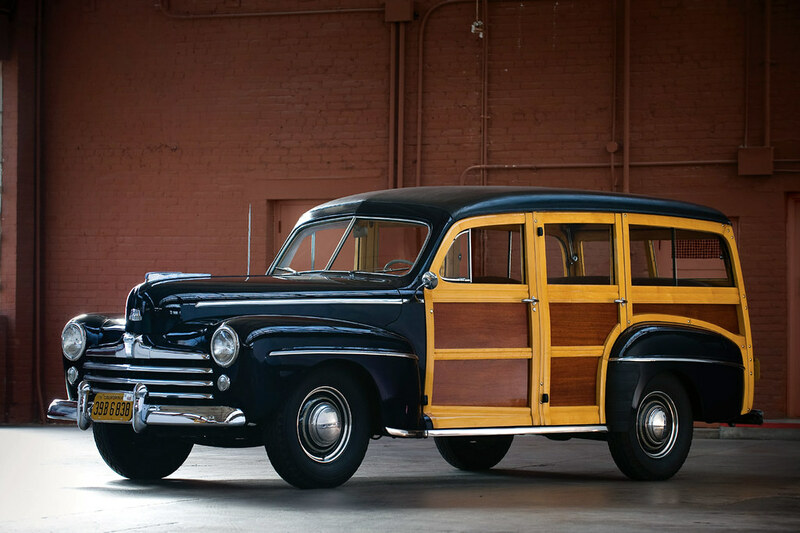 Post-war now, with the super-desirable 1946 Ford Sportsman. 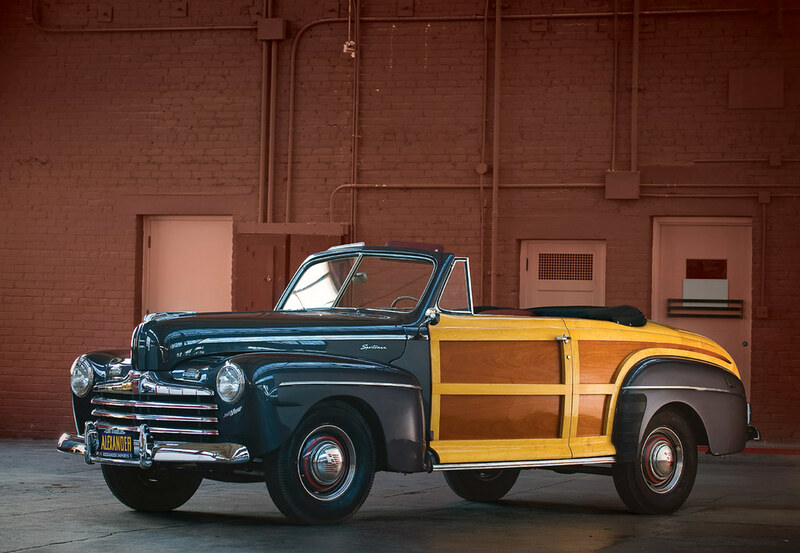 Ford's only new early postwar model, it was a woody convertible designed to lure buyers back to dealer showrooms after World War II by adding a touch of glamour to a very familiar-looking model line. 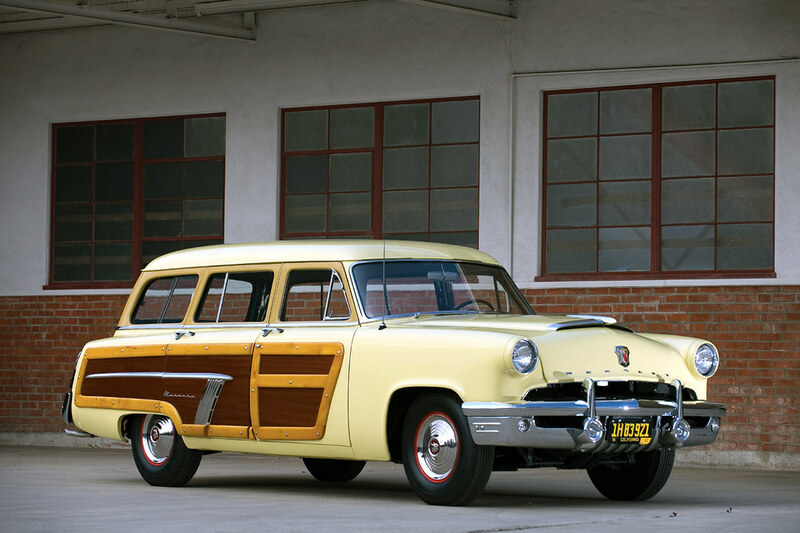 In Ford's case, the result was actually two cars, the Sportsman and a kissin' cousin, the Mercury Sportsman, of which only 205 were built. 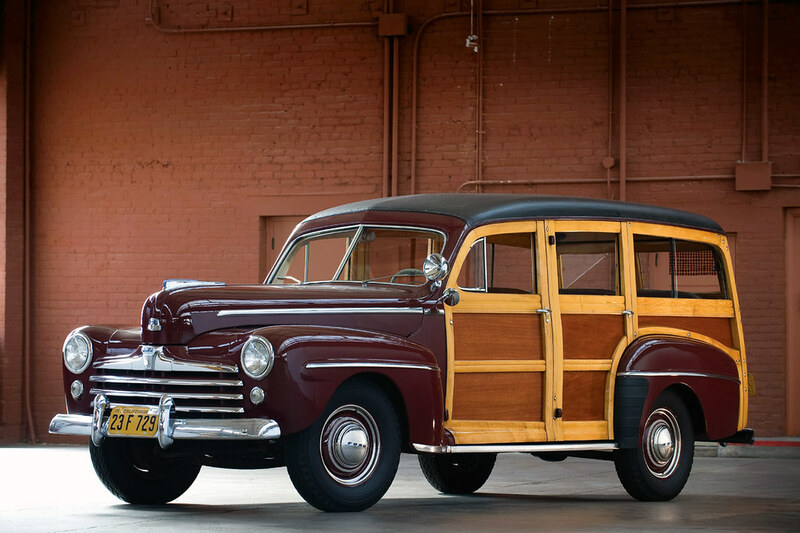 The idea attracted Henry Ford II because it was easy and cheap to execute. The company already had massive northern timber forests and a processing plant at Iron Mountain, Michigan. 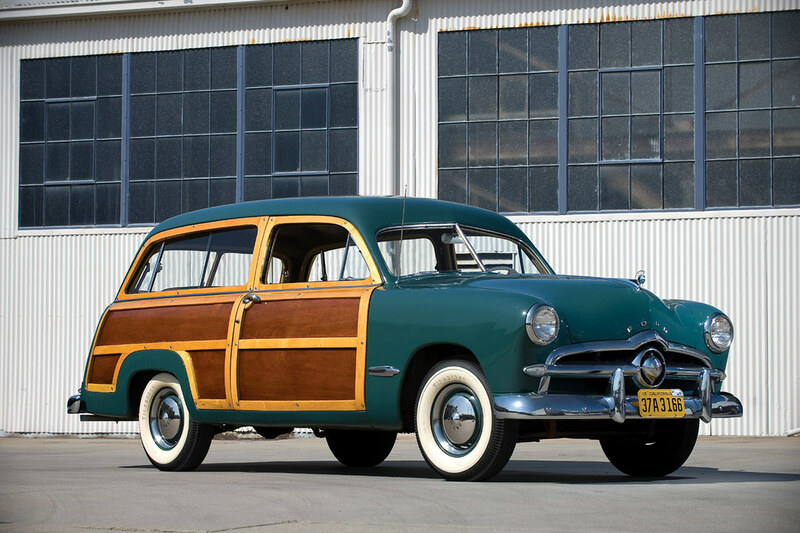 It had been supplying raw materials for Ford's woody wagons since 1936, and a convertible would be no more costly or difficult to build. 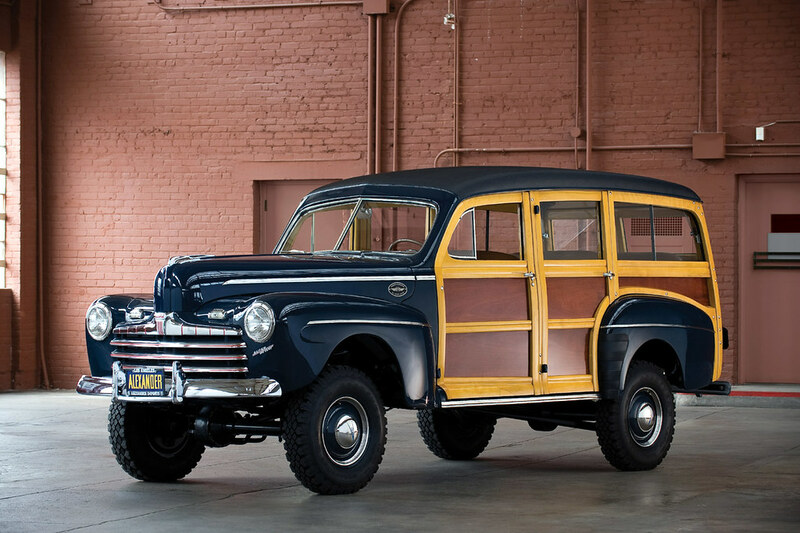 A 1946 version of the Marmington-Harrington 4x4 conversion (based on a Super Deluxe Station Wagon) as on the '40 above. 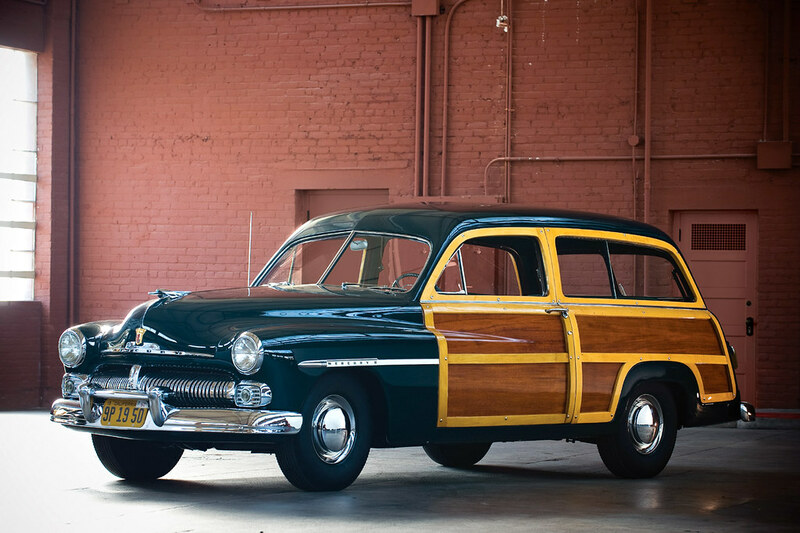 This and the Sportsman would have made a nice pair on your driveway. They'd have cost you over half a million dollars to realise that dream mind, as the Ford and Mercury Sportsmans (Sportmen?) 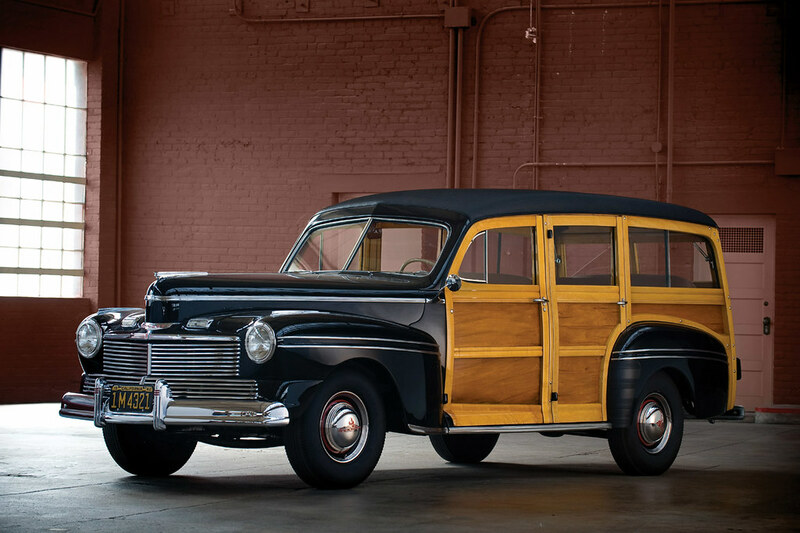 pictured went for $275,000 and 368,500 respectively, and this'46 wagon went for $247,500. 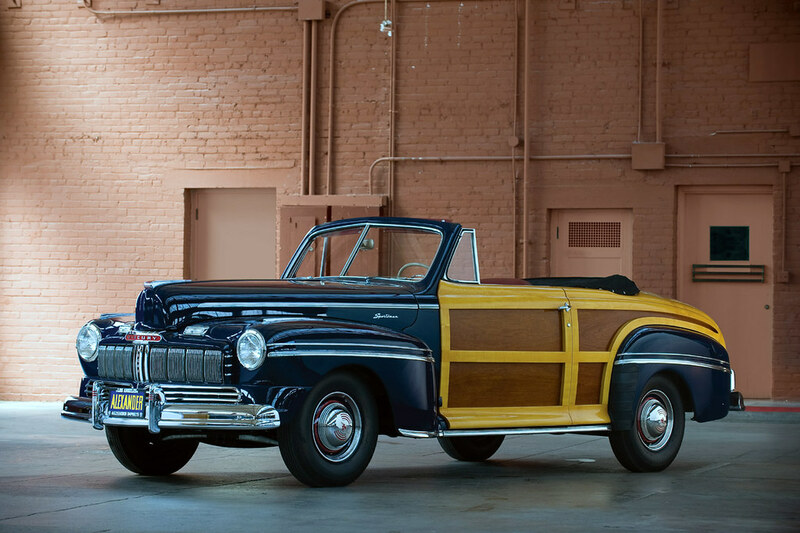 1947 seems to be another favourite year for Nick Alexander; 6 examples of Fords and Mercurys! Ain't she a honey? 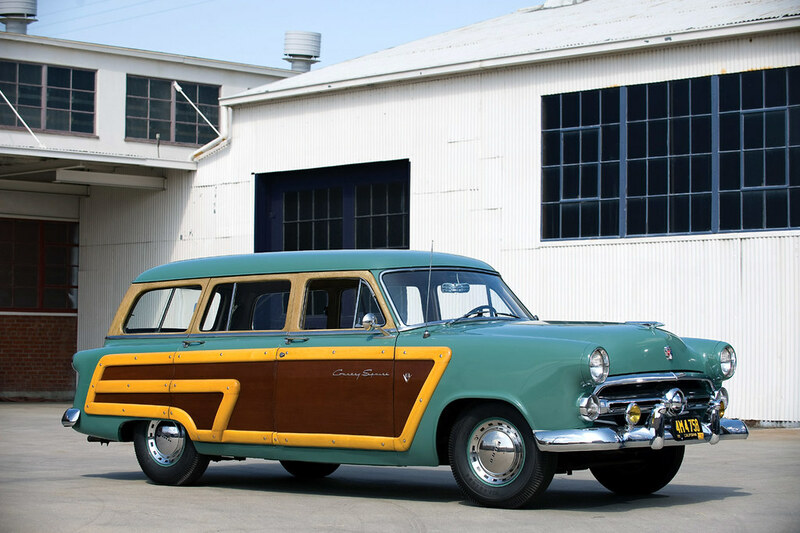 The 1950 'shoebox' Ford was all-new (except the Flathead V8), so naturally a Woody version was built. Beautiful. 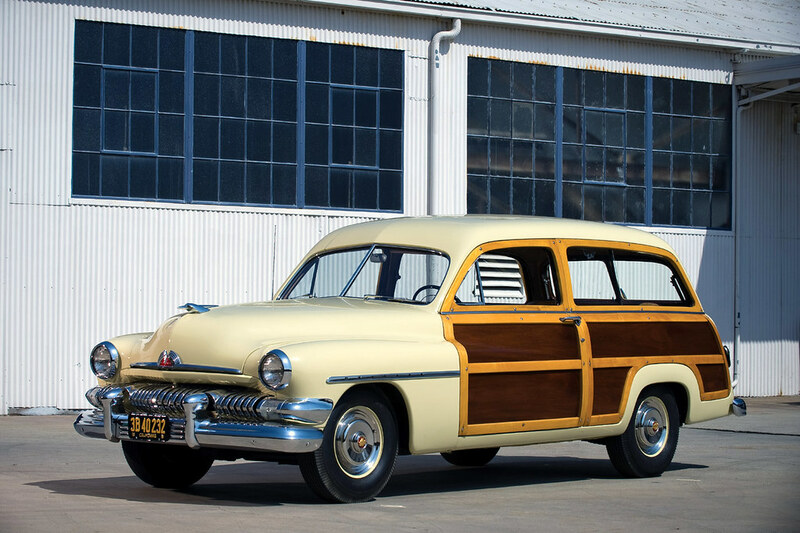 ...and '51 Mercury 8 Station Wagons. I know this sounds sacrilegious, but imagine building a Hirohata-style leadsled based on one of these babies? The beginning of one dynasty, the beginning of the end of another. 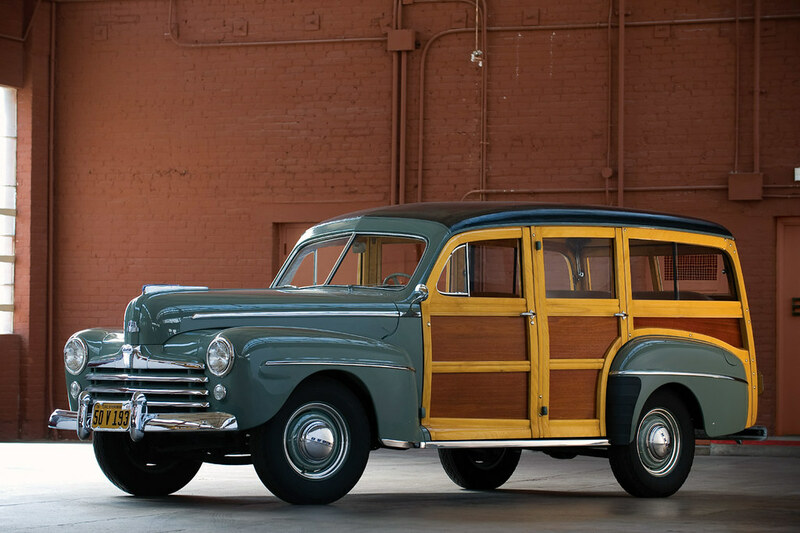 The first generation Country Squire, like the '49-'51 Mercurys above, was the last true woody. 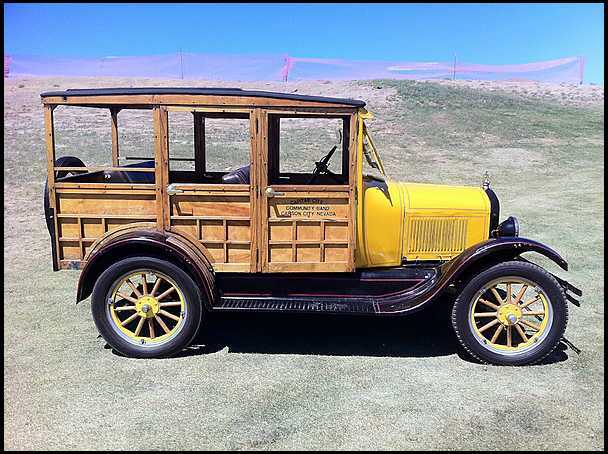 The chassis, and front-end sheetmetal were made of steel; the rear of the car's body was made of wood, but attached to a metal frame. From the mid 1950s onward, the rear body was composed of fibreglass panels covered by a plastic appliqué (DiNoc) printed to simulate wood. 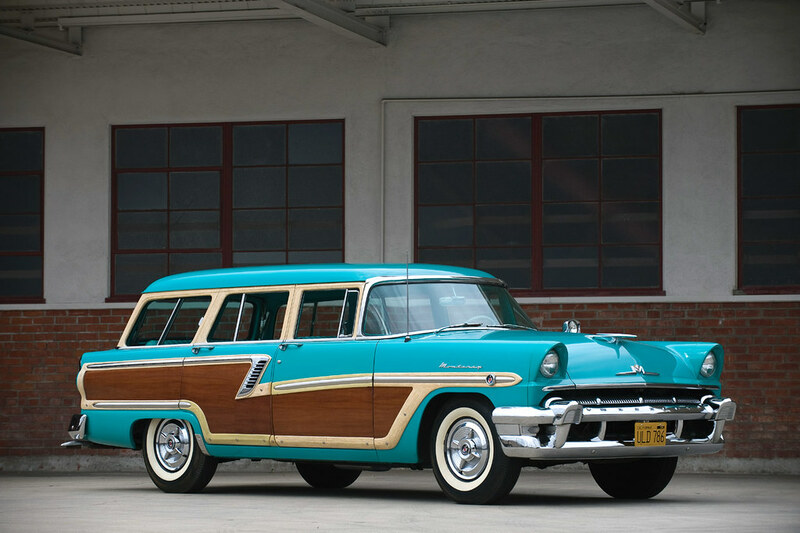 '52 Country Squire, '53 Mercury Monterey. 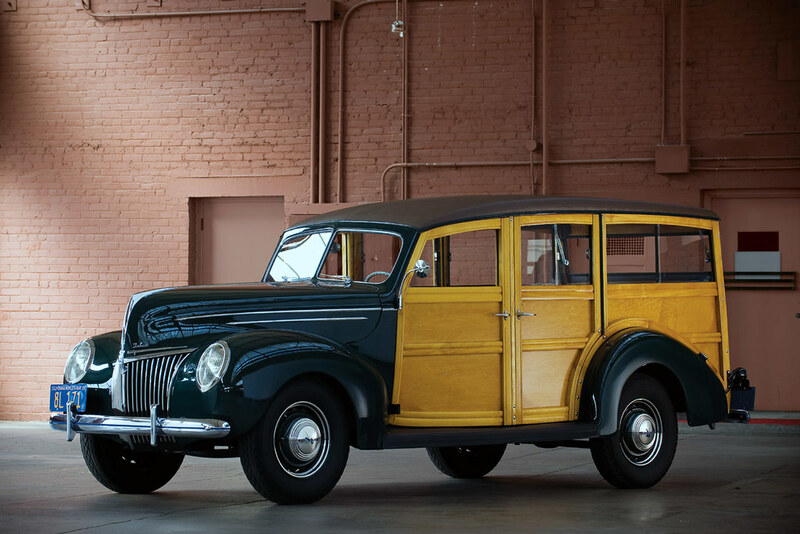 The next model year, the legendary flathead V8 was honourably retired, in favour of Ford's all-new OHV Y-Block V8. 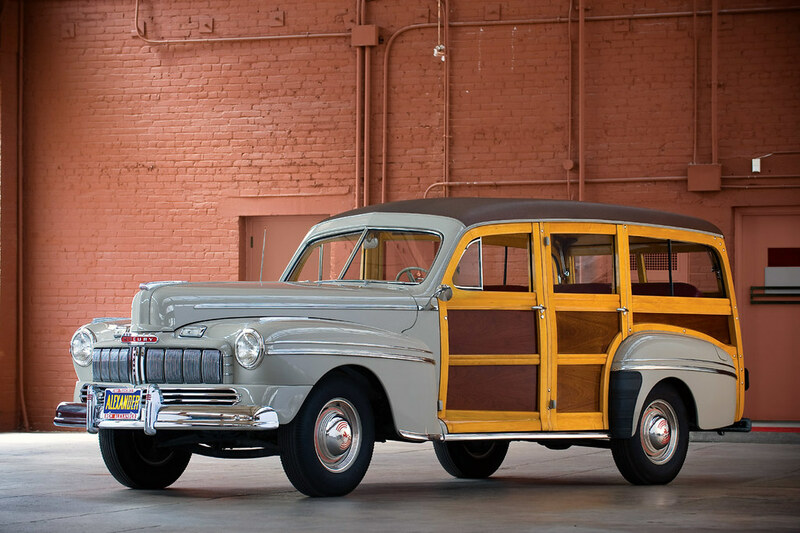 '56 Monterey. 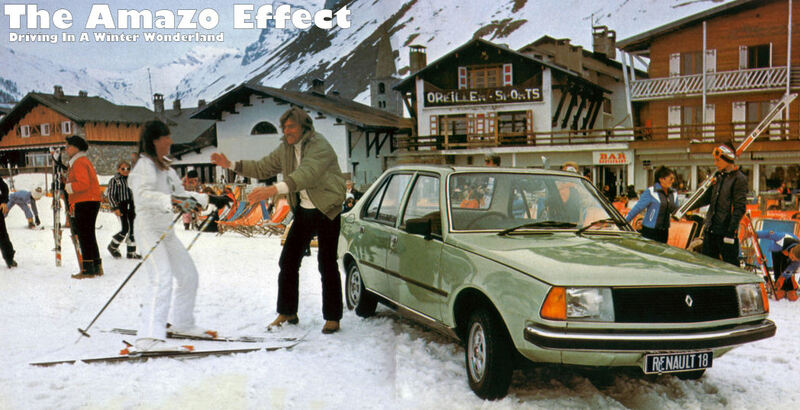 To think that these were the family cars of their day, piled up with shopping and 2.4 kids. Nowadays I'd just strap a surfboard to the roof and go cruise. 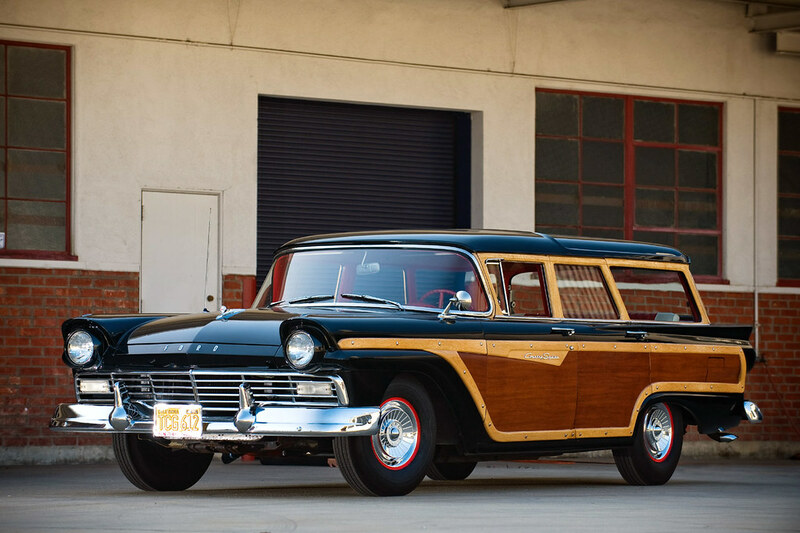 '57 Country Squire.This was the youngest car of Nick Alexander's collection; black suits it down to the ground. 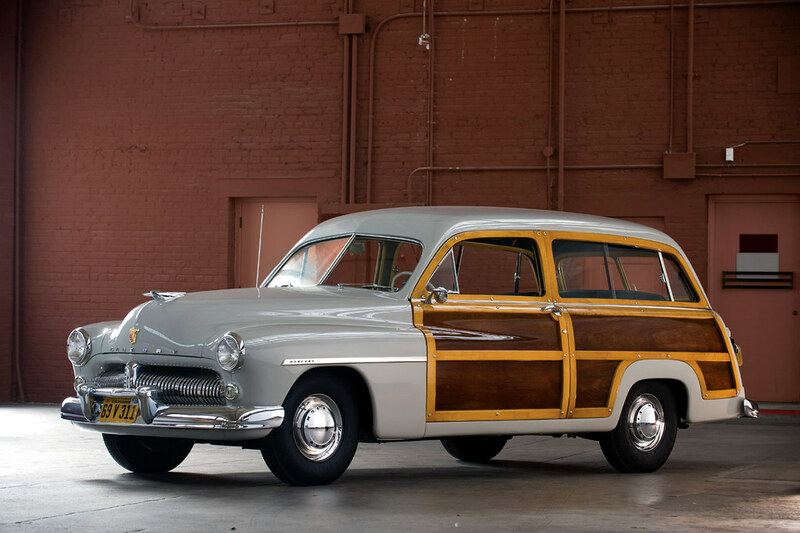 The woody phenomenon continued until the mid 90's/2000, but was increasingly out of step with modern (read snobbish) American car tastes. A shame; wood could still look good, if used the right way. Alpine-Renault A442, Le Mans 1977. Slammed Citroën Ami - Bas, Bas Citron! 1951 Kaiser Drag'n - Here Be Dragons!